“Climate communicators” always have the same “right” interpretation for every weather event: It’s climate change! A warm, especially dry summer in Germany? Climate change! We reported on this just recently. Fig. 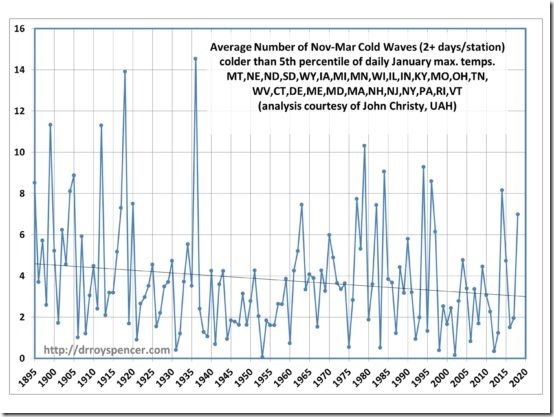 1: The frequency of “vortex” events in the USA. Source. No increase, and also no significant decrease. The linear trend in Fig. 1 is rather an expression of randomness. We find no confirmation of the “PIK data evaluation”. What does Rahmstorf explain to us further? Rahmstorf is not changing the scene unnoticed: What he means is a suspected phenomenon: a warmer Arctic with less ice in winter produces colder temperatures over the northern continents. Fig. 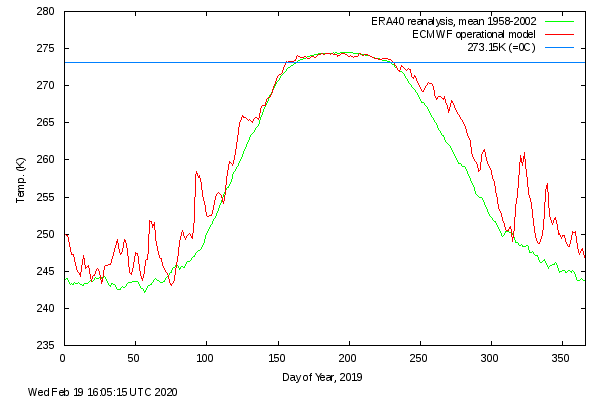 2: Temperatures at the core of the Arctic north above 80°N for January, 2019 (red) and the long-term mean (green). Completely normal! Source here. Another evaluation for the entire Arctic in the period in question finds: Temperature deviation for 66-90°N is 0.0. 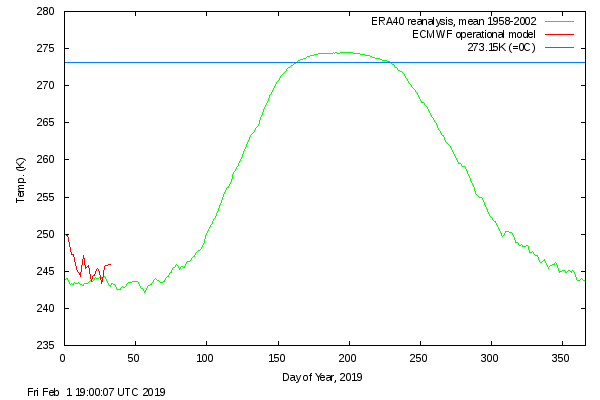 So it turns out Rahmstorf has no reliable climate explanation for the event between 20 and 29 January 2019. What he has to offer us are controversial studies that detect a change in circulation due to a warmer Arctic with less ice, with the result that it tends to become cooler over the continents in winter. There are papers that suspect this, and there are papers that reject it and which go unmentioned by Rahmstorf, of course. Prominent Swiss meteorologist Jörg Kachelmann is quite annoyed by the nonsense. So are we. And we ask ourselves why is so much unproven and controversial material used to explain every current event in the world? Are real arguments like global warming at a rate of about 0.125 ° C / decade since 1950 (as to Cowtan & Way) too weak? Is climate change something that requires a high advertising effort to sell? These PR campaigns, however, turn out to be baseless: every advertisement that runs too often only ends up annoying the consumer. The background is not science, as the consumer is supposed to believe. Instead, political ambitions are playing the main role. This is truly thin ice!